This dimension exists on the Spiritual Plane, where Consciousness expresses itself as higher feelings like universal love; love that goes beyond human beings and friends into a universal love for all life. In his book, "Whispering Winds of Change", Stuart Wilde predicts that this is the next big step in human evolution. "As people go within and establish that infinite being and embrace a higher practice and celestial perspective, their power radiates silently and powerfully, effecting change in their community without anyone realizing the source of that change or even that it is actually happening" (1993, p. 274). 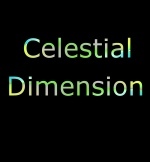 This dimension can be accessed through the Ajna or 3rd eye chakra in the center of the skull (level to the forehead). "The sixth level is the emotional level of the spiritual plane, called the celestial body. It extends about two to two and a half feet (60 to 75 cm) from the body. It is the level through which we experience spiritual ecstasy. We can reach it through meditation and many forms of transformation work. When we reach the point of "being", where we know our connection with all the universe, when we see the light and love in everything that exists, when we are immersed in the light and feel we are of it and it is us and feel that we are one with God, then we have raised our consciousness to the sixth level of the aura. "The celestial body appears to me in beautiful shimmering light, composed mostly of pastel colors. This light has a gold-silver shine and opalescent quality, like mother of pearl sequins. Its form is less defined than the etheric template level in that it simply appears to be composed of light that radiates out from the body like the glow around a candle. Within this glow are also brighter, stronger beams of light" (Barbara Brennan, Hands of Light p.53).